Richard Dingley | Launceston Then! Richard was born in 1792 to Richard and Mary Dingley at Netherton, Rilla Mill in the parish of Linkinhorne. He was baptised on May 8th 1792. His father farmed 280 acres at Netherton. Richard became deeply religious at an early age falling in with the rising non-conformist movement of that time. 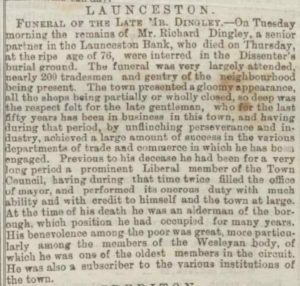 Moving to Launceston, he married Ann Pearse of St. Stephens. Together they had two children, Eliza Jane born in 1828, and John born in 1829. 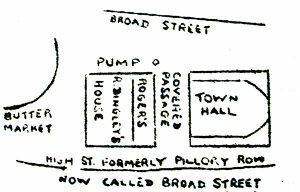 At Launceston, Richard set up as a grocer and watchmaker with a shop next to the old Town Hall/Assizes Court in the town centre (below). Working as an informal partner with Gill & Co of Tavistock, he ran a bank alongside his grocery business. This soon took over and Richard eventually gave up the grocery to concentrate on the Bank. However, the informal agreement he held with Gill & Co. proved difficult and they repudiated the arrangements when it suited them to do so. Richard resigned in 1855 to form, jointly with Mr. Edward Pethybridge, formerly of the East Cornwall Bank at Launceston, his son, John Dingley and Launceston Solictor Mr. George Graham White a new bank, Dingley, Pethybridge, White and Dingley. This bank was to be later called the ‘Launceston Bank’ and through a series of mergers eventually became the ‘NatWest.’ This new venture was set up in premises in Westgate Street. Richard was also elected as a Liberal to the Borough Council and was to serve as mayor in 1843-44 and 1855-56. It was through his persistence alongside those of fellow Liberal and non-conformists Richard Peter, Richard Robbins and Edward Pethybridge that the Conservative stranglehold on the town was broken and a more progressive attitude was to prevail over Launceston. He later purchased Bamham Farm farming that in conjuction with his bank partnership. His wife Ann passed away in 1855 just as the banking business in his own right was beginning to prosper. He later remarried to Grace. Richard himself passed away August 8th, 1867, and was interred at the dissenters burial ground at the bottom of St. Thomas Hill.